NEW YORK (WABC) -- In one of the most heads up plays in recent memory, Daniel Murphy cemented his status as a fan favorite by using his noggin to take advantage of a mistake made by the Los Angeles Dodgers in Game 5 of the National League Divisional Series. The Mets trailed 2-1 in the fourth inning of the decisive game when Murphy singled. The Dodgers shifted three infielders to the right side and left no one near third with left-handed hitting Lucas Duda at the plate, and when Duda walked on a 3-1 pitch with one out, Murphy jogged to second and suddenly sprinted to third. 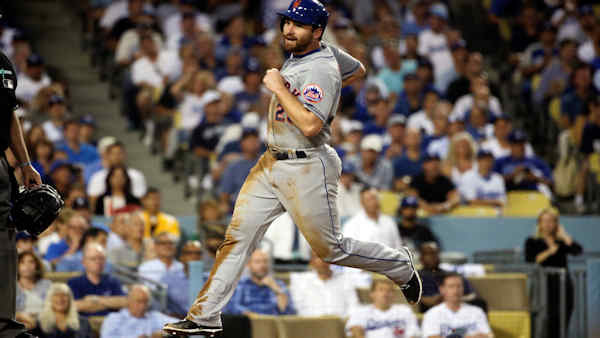 He shocked the sleeping Dodgers by stealing the uncovered third base and went on to score the tying run. Two innings later, Murphy hit a go-ahead homer off Zack Greinke.